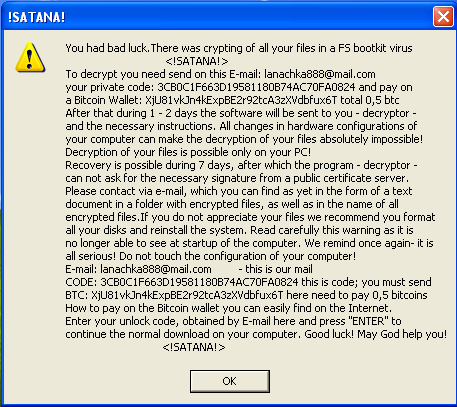 Satana is a very recent ransomware that, like Petya, will encrypt your files and infect the Master Boot Record. Since the payload has already been reversed and analyzed, I will only focus on the unpacking part. The dropper I will be using can be downloaded here if you have a Malwr account. These tricks are well known and common, you can try and bypass them using this article by Symantec or by installing the ScyllaHide plugin for OllyDbg (or equivalent). We can find multiple references to RtlXXX() functions in the code : the dropper uses the RtlDecompressBuffer() method to decompress the payload in memory and then drops it in the %TEMP% folder under a random name. Let's put a breakpoint on RtlDecompressBuffer() (Ctrl+G -> ntdll.RtlDecompressBuffer -> Follow label -> Breakpoint on first instruction). We are interested in the second and third parameter. At 0x0012EDAC, we can read the pointer to the buffer in which the payload will be written : 0x02AC0000 and at 0x0012EDB0, the size of the buffer : 0x8A00 = 35328 bytes. Right click on 0x02AC0000 in the call stack window and click on "Follow in dump". Then, in the dump window, right click on the first byte and put a memory breakpoint on Read and Write access so we can monitor it. We can resume execution and we hit the memory breakpoint when RtlDecompressBuffer() starts writing data. 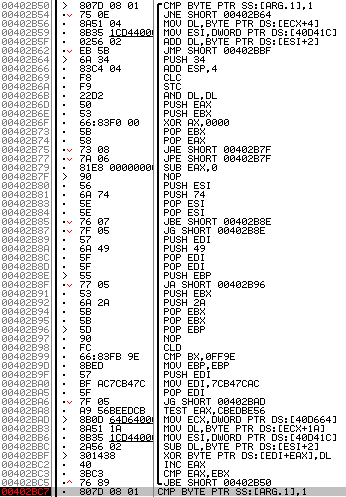 You can see it being written byte by byte. You can then press Ctrl+F9 until you get back to the dropper module. You can see the buffer has now been filled. It doesn't look like it contains a Portable Executable file yet since it's encrypted. Debugging step by step, we end up in the decryption loop that starts at 0x00402B50 and ends at 0x00402BC7. Put a breakpoint at this offset and resume execution. We can now see the decrypted payload in the dump window. You can extract it by selecting 35328 bytes and clicking on "Open in a separate dump window". Then, to save the payload as a file, click on "Backup" and "Save data to file" in the context menu. You can see the payload sandbox analysis on Malwr and VirusTotal. If you are interested in the payload analysis, you can read this article by @hasherezade from MalwareBytes.